I really like this pattern, which I picked out to make “imitation” lilac bush/tree leaves. Kant-Breiwerk naar Oude Patronen door Louise Thompson en Elis. M. Rogge – see p.66. The Jenny June Series Manuals for Ladies. Knitting and Crochet. A Guide to the Use of the Needle and the Hook. 200 Illustrations. Edited by Jenny June. (see p.71-72…for a nice border pattern). I bet there’s more too. The collections are pretty amazing. Foundation: unfinished slipknot (usk, see image in my blogspot post for details re usk), ch3, sl st in usk to join. Rnd 1: ch1, 10sc around, sl st in 1st sc to join. 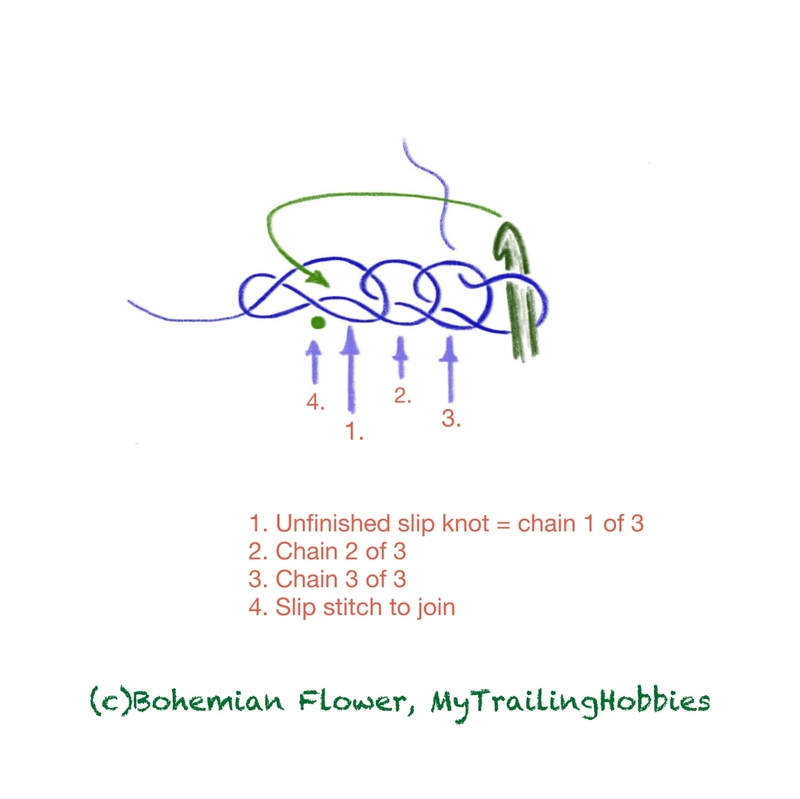 Rnd 2: ch4, 3tr closed cluster (chain 3 loop on hook, work 3 incomplete trs in same sc as join – 4 loops on hook, yo, pull through 3 loops – 2 loops on hook, yo, pull through remaining 2 loops to make a closing chain – 3tr closed cluster complete); ch4, sl st in same sc as join. One petal complete. (sl st in next sc. In next sc: sl st, ch4, 3tr closed cluster, ch4, sl st) x4; sl st in sl st to join. I like regular lilacs too – just work 8 sc in Rnd 1 and make 4 petals. The other day, I felt like doing some knooking, but didn’t have a knooking needle – there happened to be none available in any of the huge craft stores nearby the day I wanted to try knooking, so I ended up using a tunisian crochet hook and a piece of satin cord, which made what I call my perfect DIY knooking needle. The satin cord was too thin to make the knooking process faster or easier; a thicker cord made too big a knot that would not slide through loops. It was not a speedy process, but the tool did work well enough to satisfy my curiosity about the knooking technique. I’ll be doing more of it once I have an adequate knooking needle. Oh yes, if you have one of those double end crochet hooks (or a Tunisian crochet hook with a soft and flexible cord attachment, which I don’t have so I used a satin cord), you can do Tunisian crochet, classic crochet, and knooking, which will produce knit-like fabric!